The Winner man returns for a second DVD recording. Chapters of Grace will be a high tempo RECORDING. There's going to be lots of praise and energetic songs. Other artists performing on the day includes the likes of Omega Khunou, Mkhululi Bhebhe, Sbu Banda, Lindiwe Bestlady and many more. Worship session will also be the order of the day, a Holy Ghost filled event. 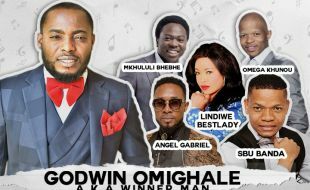 Godwin Omighale is an energetic Nigerian singer, songwriter and worship leader.